Add a touch of splashing water and a natural hint to your favorite bird bath using the Ancient Graffiti Copper Lotus Dripper Fountain. Moving water not only deters mosquitoes from laying eggs in your bath; it also helps attract birds to the area for a busy and lovely watering station. This intricate unit will certainly add fascinating height to your bath, while keeping the water moving and enhancing your bird garden. A delicately crafted, lotus flower shape creates the top of this dripper, elevated from the leaf-like base by a tall, thin stem. A port at the bottom of the leaf shape attaches to the included pump, which rests submerged in your bath and surrounded by a metal frame. This pump pushes water through tubing within the stem and to the top of the bloom, from which it gently cascades back into your bath. The splashing of the water as it recirculates helps attract your feathered friends, and also keeps it from stagnating. The copper body of the lotus sculpture brings an elegant hint to your yard, and it will weather over time to a lovely verdigris hue. A flow adjuster on the included pump allows you to increase or decrease the fountain strength to your liking, while four suction cup feet keep it stable in your bird bath. The steel frame further protects the pump from any debris or avian activity, and an opening here accommodates the cord. 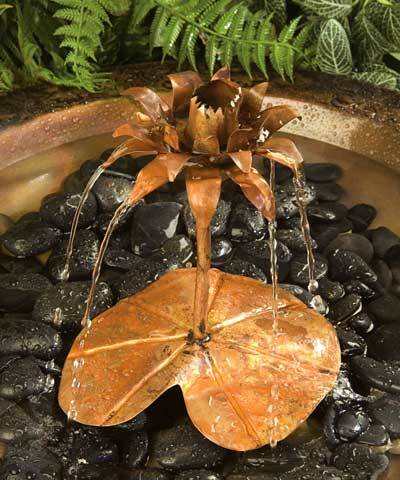 Enjoy both moving water and bird watching in your backyard with this Copper Lotus Dripper Fountain. Some assembly required.